The film opens with warrior Li Mu Bai (Chow Yun Fat) sits with his long time friend and fellow warrior, and hopefully future lover Shu Lien (Yeoh), and confides to her that he is looking for peace, and wishes to give up his sword, the Green Destiny. It’s apparent right from the start that they are in love with each other, but neither of them act on their desires, hiding behind honor and duty, but now it appears that may change. Li plans to give the sword to their friend Sir Te, wanting to retire from searching for his nemesis Jade Fox (Pei Pei), who had killed his master years ago. It’s easy to tell that this is what Shu Lien has always wanted. So much is said here with glances and mannerisms. It’s a testament to great acting to watch everything said between them-and what goes unsaid. We next meet Jen (Zhang), the daughter of Governor Yu, who is to be married to a man she doesn’t love. She confides to Shu Lien that she desires a similar life to hers, full of adventure and fighting, and freedom. In many ways these two opening conversations are the gears that turns the entire film. That night, a female assassin steals the sword, and what ensues is a stunning rooftop chase as Shu Lien tries to retrieve the sword, and it is here we get the first fight in the film, a stunningly fluid and graceful fight between Shu Lien and the assassin, and it is nothing short of a magical staging of movement and speed. The wirework here, as it will be for the entire film, is some of the best ever seen. The assassin escapes Shu Lien due to a third party taking an unsuccessful shot with a dart at Shu Lien. Right before Shu Lien engages the assassin, Inspector Bo, a kind hearted man who shows that in order to fly around and do amazing things you have to be skilled in martial arts, and is in many ways the “normal” person we can relate to who is clearly outmatched by opponents who can defy gravity, sees two circus performers, a father and daughter, engage the assassin, and also finds that Jen was not in her room during the theft, follows the circus performers, believing that they know more than they let on, and he’s right, as he spies on them the next day, seeing them preparing weapons for some sort of upcoming battle. Acting on her suspicions after hearing Bo’s report, Shu Lien visits Jen and marvels at how great her calligraphy is, and notes that it point to skills at swordsmanship as well. There are many martial art films that place skill in one as the same as skill in the other. Meanwhile, Bo goes through the circus performer’s belongings and is caught by them, and they reveal that the father is Inspector Tsai, and along with his daughter are hot on the trail of Jade Fox, whom they believe is hiding among Governor Yu’s entourage. Li Mu Bai returns to Shu Lien, and hears that the sword has been stolen. That night Jade Fox attacks Tsai, his daughter, and Bo, who is more in the way than actually helping. Bo isn’t incompetent, but has no idea the level of skill it would take to beat Jade Fox. Li Mu Bai joins the fight, and Jen stops him before he can kill Jade Fox, and they escape, but not before Jade Fox kills Tsai. Once again, this is a stunning fight. The choreography is smooth and the performer’s movements are perfect, and almost lyrical in its execution, but while hypnotic to view, the intensity is heightened, and I found myself not wanting Bo, of all people, to get killed. He runs through the choreography like a bull in a china shop, and that’s the point. This is also Chow Yun Fat’s first martial arts fight, I believe. It’s hard to believe that in real life he doesn’t know any martial arts. His movements make him look as if he’s always known it. 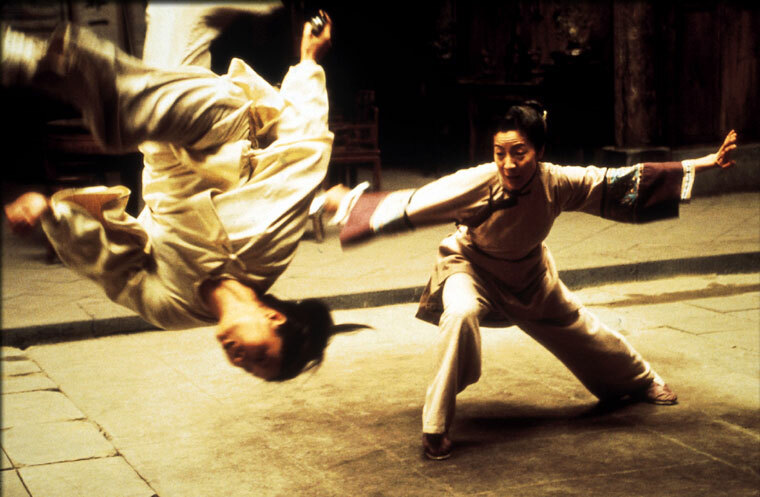 Cheng Pei Pei does a fantastic job here, and it’s amazing to see her martial arts skills are still intact since audiences haven’t seen her in quite a while. The next day Shu Lien visits Jen, and uses wordplay and a dropped cup to discover that Jen is indeed the thief who stole the sword. This was a duel of words, and Shu Lien won. That night Jen tries to return the sword, but Li is waiting for her, and engages her in a fight to test her skills, and take back the sword, which Li does. He offers to become her master, but she refuses and leaves. When she gets home, Jen throws Jade Fox, who had been masquerading as her nanny, out, Jade leaves, but not before threatening that she would teach Jen one more lesson in due time, feeling betrayed that Jen had studied the Wudan texts and left items out for Jade Fox. The student had become the master, and Jade would have none of it. Meanwhile Li takes back his sword, and has one last mission: to train Jen and take his revenge on Jade Fox. What follows is without a doubt one of the greatest martial arts films ever made, and the story may be the best as well. This film is about two different kinds of love: the reckless kind we get into as youngsters, and the more reserved, mature love that can only come with life experiences, but the tragedy here is that Li and Shu Lien never consummate their love, and the words that hang in the air the entire film only come when it is too late. On the other hand, the love between Lo (Chen), a bandit whom Jen met long ago and fell in love with, and Jen is reckless, and ultimately leads to the trouble that eventually will destroy the lives of everyone else in one way or another. Chow Yun Fat brings a calm, effortless performance as the stalwart warrior Li, who now wants to only lead a peaceful life with Shu Lien. Michelle Yeoh gives what may be her best performance as Shu Lien, and you can see that there is a fire that burns beneath her surface, almost hidden by layers of duty and honor. Yeoh does so much by not saying anything, letting her facial expressions and movement show her feelings at any given moment. Zhang Ziyi became famous after this film, and you can see why. She is terrific as Jen, and plays her as a dreamer who wants to be free, as all youth do, but is ill-equipped to deal with the consequences of her actions. Her face is also incredibly expressive, and her fire, unlike Shu Lien’s, burns at the surface, and she is determined to get what she wants, but is unsure how to do it. Cheng Pei Pei is also fantastic as Jade Fox, a vindictive woman who actually wanted Jen’s love, and while I knew she was bad, and she was, she wanted a daughter’s love, and is crushed when it isn’t given, which makes her a pitiable character. Yuen Woo Ping is heralded as one of the greatest fight choreographers of all time, giving both Jet Li and Jackie Chan some of their best choreographed films, and proves once again that he is indeed one of the best with his efforts here, and while overall I’m not a fan of wirework, delivers some of the best I’ve ever seen. 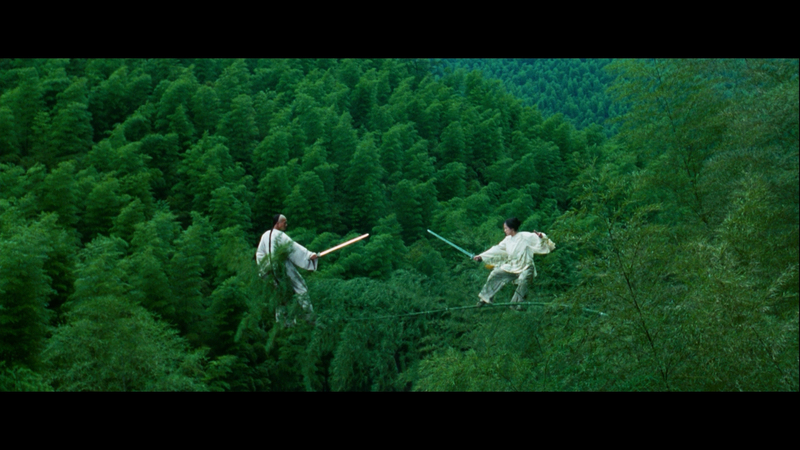 The fight in the bamboo trees between Li Mu Bai and Jen is one of the greatest cinematic scenes ever. The camerawork was impeccable, and the movements and fighting almost seemed as if if came from a dream, and the shot of Li Mu Bai standing on a branch, swaying to and fro effortlessly with the branch, is a stunning shot that you’ll remember days after you see it. 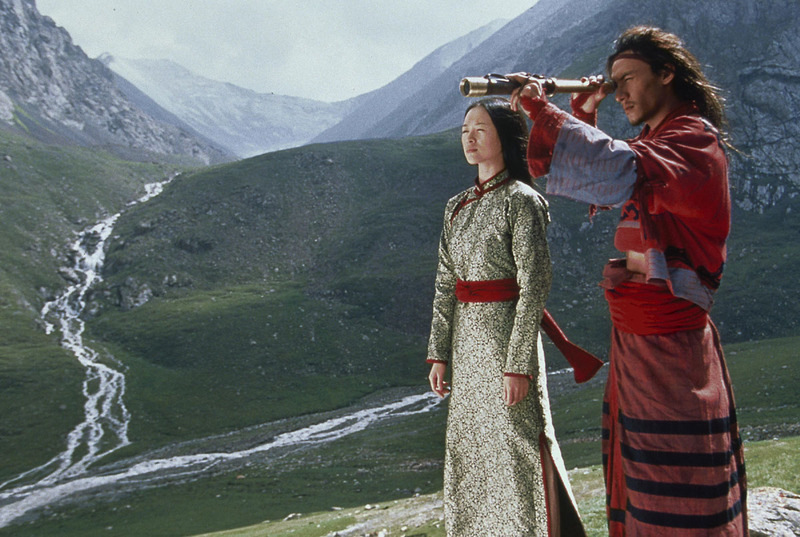 Ang Lee and cameraman Peter Pau made this film seem like a piece of moving art, and you would use words to describe this as you would of an elaborate stage dance: Beautiful, exciting, graceful, balletic, and motion that can take your breath away. CHOREOGRAPHY: (10) Yuen Woo Ping makes what may be his best choreographed series of fights ever, and that’s saying something. There isn’t a single fight from big to small that wouldn’t be the end fight of many lesser martial arts films. It’s that good. STUNTWORK: (10) The tea house fight was incredible, and it was the actual actors suspended so high during the bamboo forest fight. Everyone did a fantastic job, and the men and women who worked the wires deserved an Oscar of their own. STAR POWER: (10) Chow Yun Fat is in top form here, as is Michelle Yeoh, and Zhang Ziyi would go on to star in many more successful films, and Cheng Pei Pei shows she’s still got it. FINAL GRADE: (10) As if there would be anything less? Ang Lee has made a martial arts film that will stand the test of time, and spawn a new genre of film that the likes of Zhang Yimou would take up the torch and run with it. Not only one of the greatest martial arts films ever, but one of the greatest films of all time. I’ve watched this film a couple of times but I don’t like it and I can’t understand why. Yuen’s choreography is as great as always, the production values are gorgeous and the cast are great (especially Cheng Pei pei). I usually love Chow Yun Fat but he didn’t convince me in this. I found his movement stiff and unconvincing. But there is plenty about the film that is impressive. But I find it a glum and tedious film to watch. I just don’t know why.